Our chair project grew out of our beginning of the year study about ourselves. After exploring our names, birthdays, families, and friends, we made a web with ourselves in the middle. In several brainstorming sessions, the children generated many interesting topics for our web including homes. When we webbed further under the homes idea, the children were interested in exploring items found in their homes including furniture and machines. In later sessions, we listed many items of furniture that were of interest with chairs fascinating teachers and children alike. Little did we know how far the children’s interest would carry us! We generated questions about chairs that included types (lawn chairs, high chairs, wheelchairs, easy chairs), materials from which chairs are made, sizes, and more. We solicited “chair stories” from the children and involved the parents by asking for photos of favorite chairs. With the help of parents, friends, and colleagues, our investigations took off. Wanting to stay close to home for fieldwork, we began the study with the chairs in our school environment. Each child chose a classroom and specific chair to explore. 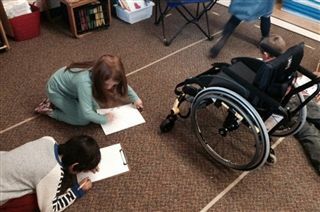 They did observational drawings, recorded chair measurements, and took photos, then returned to class to discuss and compare the results with classmates. Once we had explored the variety of chairs in our school, we invited parents and colleagues to be guest experts and share chairs of interest with us and talk about its importance and “history." We had an overwhelming response. A teacher’s friend donated an old swivel easy chair that remained in the classroom all year. There were children who were fascinated with the swivel mechanism and explored springs and how they worked. Others wanted to know about the fabric and elements in upholstering chairs. A group even re-upholstered a teacher's desk chair! A local medical supply store lent us a wheelchair for an entire week free of charge. A parent, who had spent several weeks of her pregnancy in a wheelchair, came as our expert to talk about her experience. The wheelchair was taken out to our playground and each child had a turn maneuvering it. Another parent arranged a visit by a young man who demonstrated his electric wheelchair and the van that helps transport him places. We explored an antique wooden highchair that converted into a child rocker. The gear mechanism became intriguing and a small group of children studied about the gears and how they worked in this chair. A gear center was set up so that children could learn about gears through manipulative play. The drama center was turned into a chair factory. Children used big blocks, cushions, fabric, and other materials to create chairs to sell. Other props included a cash register, computer, charge cards, and student-made money and sales slips. As each chair remained in our room, children used a variety of media to represent the chairs. Working with useful junk, model magic, wood, paint, and fabric, the children constructed their favorite chairs for our parent display. Parents were invited to our “Chair Museum." They circulated the room and discussed the different chairs with child experts at each station. The children answered questions and demonstrated their knowledge during this period of time. In addition, parents were treated to the array of representations that filled our room. When we started this project, we had some misgivings about the topic and how interested the children would remain as we expanded the idea with them. We could not have been more wrong! We were amazed at the depth of attachment that the children expressed in the stories they told. Parents were intrigued by the importance of these objects in their child’s life. This project has wonderful potential for those teachers who have difficulty leaving the premises for field work. So much of what we did took place in our own surroundings with the “work” coming to us.